A literal reading of the Bible leads one to the inevitable conclusion that the earth was created in six days about six thousand years ago. This conclusion is arrived at by simply calculating the Bible’s chronological data. By doing the math, some have gone as far as to approximate the date of creation at 4175 B.C. The Bible’s teaching of a young earth exposes a fatal flaw in today’s evolutionary science. The theory of evolution is based upon the assumption that the earth is billions of years old. If such is not the case, the rug is pulled out from under modern-day Darwinists and the theory of evolution is rendered untenable. For this reason, evolutionists are determined to discredit the Bible’s teaching of a young earth and to dupe the whole world into believing their theory of an ancient earth. In an effort to escape the ridicule and ire of today’s scientific community, some Christians attempt to square the Scripture with contemporary scientific theory by putting forth what has become known as the Day-Age Theory. This theory contends that the six days of creation in the first chapter of Genesis are not 24-hour days, but long and indeterminate ages or eons of time. Thanks to providing Christians with a way to nod their heads to contemporary scientific theory without having to wag their heads at the Bible, the Day-Age Theory has gained considerable popularity, even to the point of being advocated by a number of prominent Christians. Perhaps, the strongest argument for the Day-Age Theory is found in the fact that the Hebrew word used in the first chapter of Genesis for “day” (yom) has a variety of meanings, including “age” and “long period of time.” However, everywhere the Hebrew word “yom” appears in the non-prophetical texts of Scripture, as it does in the first chapter of Genesis—preceded by a numeral, in its plural form, and modified by the phrase “evening and morning”—it is always referring to a literal 24-hour day. It is my belief that the actual text of the Genesis account of creation provides us with ample evidence to conclude that the six days of creation were literal 24-hour days. For instance, Genesis 1:5 reads: “And God called the light Day, and the darkness He called Night. And the evening and the morning were the first day.” Notice, the “first day,” like any 24-hour day, consisted of both evening and morning, as well as day and night. Also, Genesis 1:14 clearly differentiates between “days” and “years,” leaving us no possible interpretation for what is meant by “years” if “days” are to be interpreted as “ages” or “long periods of time” rather than literal 24-hour days. As is proven by the above, there is no scriptural reason to conclude that the six days of creation are anything other than literal 24-hour days. The only conceivable reason for advancing such a hypothesis is to square Scripture with contemporary scientific theory; however, the Bible need not be tailored to fit contemporary scientific theory. Instead, contemporary scientific theory ought to be tested as to whether or not it fits with the Bible. What about all of the scientific evidence supporting the evolutionists’ contention that the earth is billions of years old? Well, unfortunately for the evolutionists, their dating methods, like their cockamamie theory, is based on erroneous assumptions. 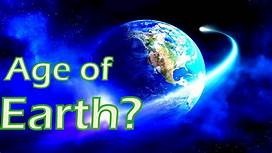 Whereas their theory is based on the assumption that the earth is billions of years old, their dating methods, like radiocarbon dating, is based on the assumption that the carbon-12/carbon-14 ratio has been the same for at least the last hundred thousand years. Of course, both of these assumptions, the one upon which evolutionary theory is based and the one upon which carbon-14 dating is based, are refuted by the Bible. According to the Bible, the earth is not billions of years old, but only six thousand years old. Furthermore, the Scripture teaches that the production of carbon-14 only began six thousand years ago, not to mention the fact that the entire carbon cycle was upset a mere fifteen hundred years later by a catastrophic flood. In the end, we must choose whether to believe in an ancient earth based upon the imaginative theories of fallible men or in a young earth based upon the absolute truth of God’s infallible Word, which, by the way, refutes all of the erroneous assumptions that fallible men’s imaginative theories are propped up with and allegedly proven by. You have the author's permission to print and freely distribute to others this entire manuscript or any portion thereof. If you would like to help us continue to offer complimentary resources, like What the Bible Says About the Age of the Earth, you can make a tax-deductible donation to "Time For Truth Ministries." All contributions should be mailed to: Time For Truth, P. O. Box 811, Townsend, TN 37882.